His Excellency, Denis Yap Lepatan, Ambassador Extraordinary and Plenipotentiary to Switzerland with concurrent jurisdiction over the Principality of Liechtenstein is no stranger to Switzerland. For 13 years, he was posted in Geneva as Deputy Permanent Representative of the Philippine Mission to the United Nations. In Geneva, global hub for diplomacy, banking and headquarters of Europe’s United Nations, Ambassador Lepatan mastered his craft in areas of international development policies and effective administrative management. He is known for his personal integrity and unblemished service in over 3 decades of Foreign Affairs postings in the Home Country, Geneva, New Delhi, Colombo, Rome, and now Berne. Ambassador Lepatan is a recipient of the Gawad Mabini Award, with the Rank of Dakilang Kamanong (Grand Cross). As a person, he is well-respected among his colleagues who regard him as an excellent team player, a good planner, and a decisive leader. He is married to Maria Teresa Cariño Lepatan. What is your best experience with Filipinos in Switzerland? What would be your priorities as Ambassador to Switzerland and Liechtenstein? What do you perceive as challenges of Filipinos living in this country? How can the Embassy help the undocumented? Ambassador: “As far as the Embassy is concerned, we treat everybody equally whether regular or irregular, documented or undocumented. They are Filipinos and we are duty-bound to provide them the services and documents they need. The problem really is how to deal with the local authorities because they are the ones who set the rules and regulations. 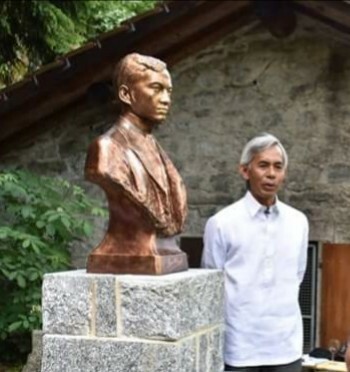 What is your message to the Filipinos across Switzerland, Europe and globally on the occasion of the 120th Anniversary of the Proclamation of Philippine Independence? With that, I thanked the Ambassador on this special occasion and wished him well.